The Just Desserts Beta - will start shipping next week! Like a lot of people, I have become keenly interested in poker during the course of the past year. This represents a dramatic shift in my attitudes about the game... for most of my life, I've generally shunned poker, having found it boring. What changed? The game itself! In case you've been living under a rock on Mars, there's this relatively new version of poker called Texas Hold'em, which has re-invented the flawed original and turned it into something a gamer like me can really sink his teeth into. What's different? I have a list of reasons why Hold'em is better than basic 5 card poker, but also, being a professional game designer, I've come up with a few tweaks of my own. It started with substituting Icehouse pieces for traditional poker chips, and now I have a list of reasons why pyramids are better than chips. When you add in our other house rules, the game becomes alien enough to be worthy of having its own name, and now that we have the Rules for Martian Hold'em, we just couldn't resist planning for a Martian Hold'em Tournament at Origins. This also leads us to consider doing a floating tournament for Just Desserts, too. Superior Game Design. Hold'em is a much more complex and interesting game than plain old poker. There's just not enough action in the original "draw 5, trade out a few, then compare" formula to hold my interest. The shared cards, the flop, the turn, and the river, plus all the additional opportunities to raise the stakes, all add so much more depth to the action of Texas Hold'em. You can't just buy your way out of a bluff. In classic western-style poker, you can keep on raising the bet until the other guy either straight-calls or folds, and once your chips are into the pot, you can't back out. Thus, if you can't keep up with the raises, you must fold, and lose your investment without even getting to show your hand. (This point was central to the plot of the classic poker-game western, "A Big Hand for a Little Lady," starring Henry Fonda.) But in Hold'em, the economy is closed, which means the maximum you can ever bet is all the chips you currently have (called going "All-In"). Moreover, the stakes are automatically lowered to the amount that makes it All-In for the player with the least amount of money. (Side bets keep the action going if more than 2 players are involved.) This means I can't force you to throw down your superior hand just because I'm willing to put my car keys into the pot and you're not. Playing tournament-style brings the game to a dramatic conclusion. The elimination-format of Hold'em turns poker into a game you can play -- and become mentally invested in -- even if you aren't playing for money. In contrast, I've never felt like there was any point to regular poker if you weren't playing for money, since the open-ended nature of a ring-style game means the game never really ends: If you lose, you just keep buying more chips until you decide to quit. But in a tournament-style game, everyone begins with a fixed number of chips, and that's all. (Some tables allow one-time re-buys, but we usually don't.) The closed economy of the tournament-style game means that when you go All-In, and lose, you're out. When combined with the Blinds (an escalating minimum initial bet mechanism, which is yet another difference that makes all the difference), this makes the game draw naturally to a conclusion, as one player after another is knocked out until a single player emerges victorious. These differences are what's made Texas Hold'em the smash hit it is today, but one change was still necessary to make it a game I myself would really passionate about: using Icehouse pyramids instead of traditional poker chips. At first, this was just an experiment, almost even a joke, but we quickly realized that the pyramids really do add value, both in fun and functionality. Pyramids just look cooler than chips. You could say that this is a matter of opinion, but that's my opinion. You don't have to remember how much different colors are worth. In some cases, poker chips denote their value numerically, but most of the sets of poker chips I've seen have been simple colored disks. How are you supposed to remember that red ones are 5 and blue ones are 25, or whatever? Betting big FEELS bigger. When someone bets with one of their large pyramids, it has impact. It just feels like a bigger deal than when you bet with a different colored (and therefore more valuable) disk. Pyramids are more useful, and more portable, than chips. If you've got a deck of cards and a fancy case of poker chips, all you can play are casino games. But if you've got a deck of cards and an Icehouse set, you can play a massive number of different games, poker included. Also, you'll have more room in your luggage, since even the most compact of poker-chip sets is bigger than a bag of Icehouse pyramids. The values are 1, 5, and 25: Regardless of the buy-in amount, pyramids have the following values: smalls are worth 1, mediums are 5, and Larges are 25. Each player starts with a full standard stash of Icehouse pieces. Ideally, each player will have a unique color, but this isn't actually required. "No Limit" also means no minimums. In standard No-Limit Hold'em, you can only raise by the amount of the current big blind, but I think the blinds provide plenty of mandatory betting. The game ends when all but 2 are out. Some people really like "Heads Up" poker, but we always stop when the 3rd Place player goes broke. The downside of an elimination-style game is that players who wash out early have nothing to do but wait for the others in the game to finish, and the longer it drags on with the last few, the more frustrating this can become. Also, I myself find 2 player poker quite dull... it's the group dynamic I enjoy, and just as I won't start a game with fewer than 5, I also don't wish to continue it after critical mass is gone and the eventual conclusion easy to predict. So, we've taken to declaring that whoever is ahead when only 2 remain wins first prize (2/3 of the pot). In the very unlikely event of a tie at this point, the final 2 will play 2 hands of Heads-Up Hold'em, repeating in pairs of hands as needed, until the tie is broken. OK, so even though Origins is now less than a month away, and the program book has already gone to the printer, we've decided to add another event to our bulging tournament schedule: a floating Martian Hold'em tournament. The medallion will feature the artwork shown at the top of this page. Like the floating Binary Homeworlds tournament which Liam is pioneering this year, the Martian Hold'em tournament will run all weekend long. To jump in, all you need to do is find a group of 4-7 others interested in competing, and start up a game. Once a game begins, the Top Rabbit will provide the stakes: 3 special cards we're making, called Bleems. (On ancient Mars, Bleems were a unit of currency.) The winner will receive 2 Bleems, while the second place player gets 1. 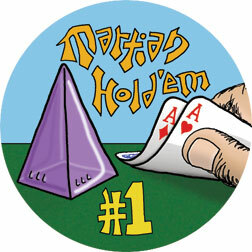 On Sunday at the appointed hour, the 8 top-Bleem holders will play a final game of Martian Hold'em, with the Medallion being the ultimate prize. Having thought of all that, it also occurs to us that we're going to wish we were running some sort of Just Desserts event at Origins, too. After all, we'll have just launched the Beta edition (the cards have come back and they look great!) and you know everyone's going to want to try it, so wouldn't it be nice for there be to a tourney? Well, maybe there can be. Since there's no room for more events on the schedule anyway, perhaps it's just as well we try this one also as a floating tournament. It will work in much the same way: with players scheduling games anytime they want (in loose, "restaurant-style" as we used to say at the earliest of Icehouse tournaments). When someone wins, they'll receive some sort of Bleem-like marker, and at the appointed hour, the 6 players with the most win-tokens will play a finals match. The drawback to tournament-structures like these are that the more you play, the better your chances of winning. But so what if it isn't "fair"? Tournaments like these become not just a measure of skill, but also of determination.